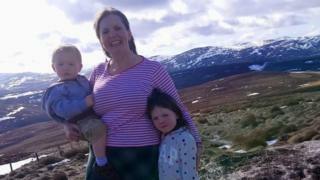 A former RAF officer who fought to have her service pension given to her children has died aged 46. Samantha McConnell, who served as a linguist for 20 years, was diagnosed with terminal cancer last year. Under MoD rules she was told that her pension would end on her death. After a campaign, Defence Secretary Gavin Williamson changed the regulations so her two children, aged two and five, would receive her payments. Friend Elaine Bielby described her death as "devastating". "She was amazing," she said. "I had a lot of respect for her and her strength. "I think she left an enormous legacy and her children, one day when they are a bit older, will be able to look back on their mum's life with extreme proudness for her." Ms Bielby said Ms McConnell died at a hospice in Lincoln last week. After leaving the armed forces, Ms McConnell, who is originally from Cornwall, achieved her desire for a family through IVF. However, with no partner, parents or siblings, she was told her pension would cease on her death and not be paid to her children because they were born after she left the service. After he reversed the decision last year, Mr Williamson said: "I hope this gives Sammi, her son and daughter the peace of mind that they deserve, knowing they have financial security for the future."